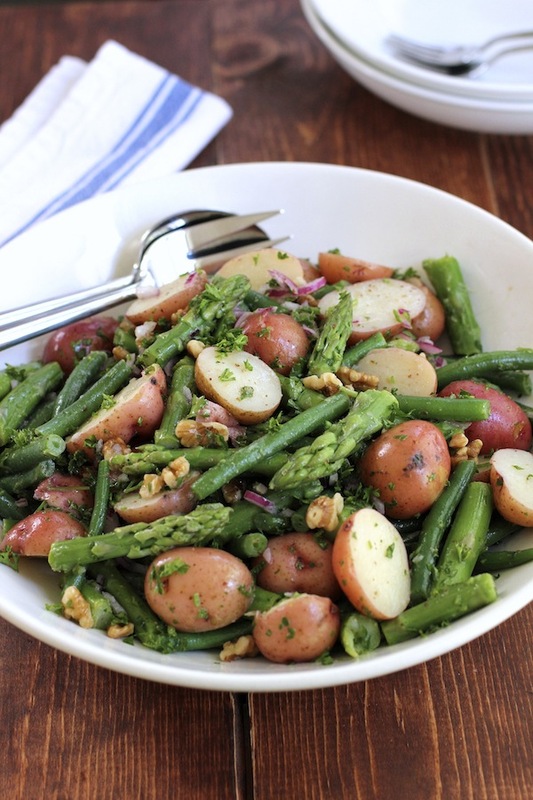 This potato salad with green beans and asparagus features small red potatoes tossed with green beans, asparagus, walnuts and a bold dijon vinaigrette. A great side dish that goes with almost anything. Potatoes and green beans are a classic combination. I thought I would mix it up a bit by adding some asparagus as well. The new potatoes are boiled and then tossed with a little dressing while still warm. The green beans and asparagus are blanched and then shocked in an ice bath so they keep their bright green color. The salad is then mixed with a dijon mustard vinaigrette, some walnuts, a little red onion and minced parsley. This salad works really well at either room temperature or served cold. It has a bold, tangy taste thanks to the dijon mustard vinaigrette. This is a great side dish that goes with almost anything. You can also bring it to a picnic, party or barbecue. I sliced the potatoes in half before cooking. This helped them cook faster. The new potatoes I used were very small – about the size of a golf ball. If yours are bigger you may want to quarter them. Cooking the new potatoes takes a little guess work. How long you cook them depends on their size. You want to start checking to see if they are fork tender about 12 or 13 minutes in. Keep checking them every minute or so until they are ready. Blanch the green beans and asparagus in boiling water and then shocked them in some ice water. This helped keep them a bright green color. The asparagus I used was fairly thick. If you’re using thin asparagus then you’ll need to cook them for a shorter amount of time. Also, when you chop up the asparagus, you want it to be roughly the same length as the halved green beans. You want to toss half the dressing over the warm potatoes to enhance their flavor. The remaining dressing is tossed over the whole salad at the end. Slice new potatoes in half or quarters (depending on size) and place in a large pot. Cover with cold water and bring to a boil. Turn down the heat to a slow boil and cook for 12 to 15 minutes – until fork tender. Snap off tough ends of asparagus and then slice asparagus into an equal size as the green bean pieces. While potatoes are cooking, bring another pot of water to a boil. Once it’s boiling add both the green beans and asparagus to the boiling water. Cook for 4 to 5 minutes. Prepare and ice bath (large bowl with half ice and half water). 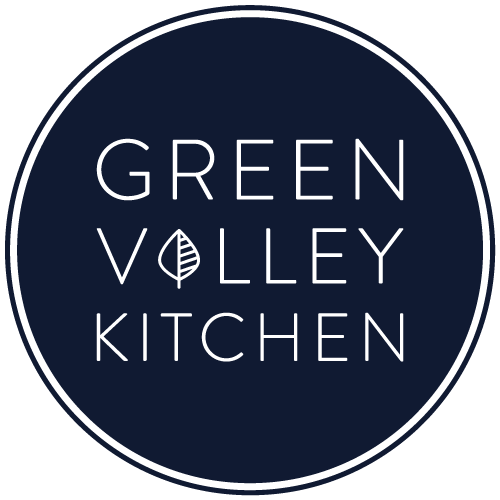 When the green beans and asparagus are ready – drain in a colander and then plunge into ice bath. Let them sit in the ice bath until completely cool. Prepare vinaigrette by whisking together olive oil, red wine vinegar, dijon mustard, minced garlic and black pepper. Mince red onion and set aside. Drain the potatoes when ready, add to a bowl, add half the vinaigrette to the warm potatoes and toss to coat the potatoes. Drain the green beans and asparagus from the ice bath. Pat green beans and asparagus with paper towel so they are mostly dry. 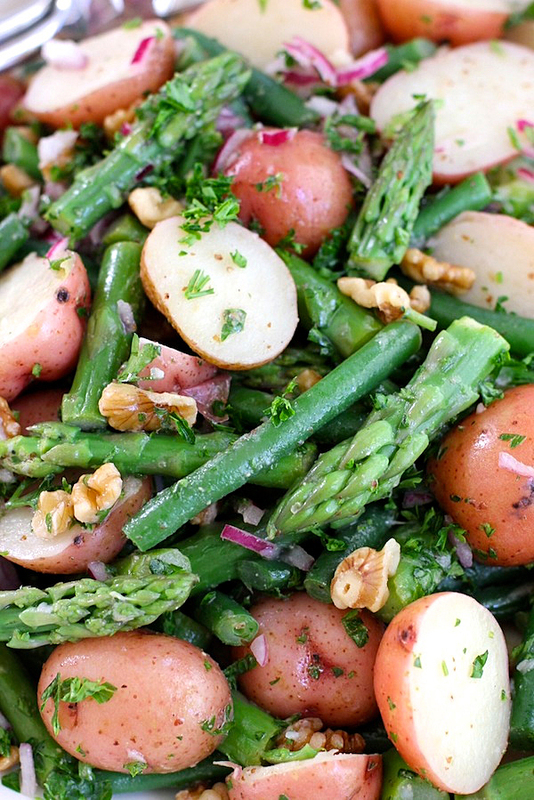 Add green beans, asparagus, red onion, parsley and walnuts to potatoes. Toss with the remaining vinaigrette and serve. My rating is based on my expectations— this sounds absolutely delicious! I will be making it today for a family gathering tomorrow. I am wondering, though, do you toast the walnuts beforehand or just use them raw? I am not sure how much difference it would make and if it is worth taking the extra time to do so… any advice? Thanks in advance! Hi Jennifer – I don’t bother to toast the walnuts. You can if you want – but I think it’s fine with them raw. Hope you enjoy it! Thanks for the rating! Absolutely delicious!! Had without the walnuts but the asparagus was a nice addition. Adding to my recipe book for sure! Thanks!! Thanks so much, Anna – I’m so glad you enjoyed it and thanks for taking the time to leave a comment! I make something similar but have never added the asparagus. I can’t wait to try this. When I do, I am also going to add some whole cherry tomatoes for color and variety. This is the best healthiest version of potato salad, in my humble opinion. If you steam, rather than boil, the veggies, you will retain even more nutrients. Prepping this dish the night before also helps mellow out the glycemic index of the potatoes, which is great for our dietetic and otherwise health-conscious folks. Hi Rachel – thanks for the info! I hate asparagus. But sometimes it sneaks into my kitchen and I can’t throw food away unless it’s bad. I blanched the asparagus one minute longer and made more vinaigrette and this is the first time I’ve liked asparagus in a recipe. Thank you for saving my groceries! Thanks so much for letting me know that you enjoyed it, Matilda! Hi Gwyn – yes, you can make it a day in advance. 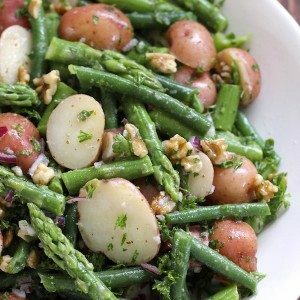 If you’re making this for company – I would cook the potatoes, green beans and asparagus as per the recipe instructions. Shock green beans and asparagus in an ice bath to retain bright green color and also make sure to add half the dressing to the warm potatoes – so they soak up the dressing/flavor. Then refrigerate veggies over night. The next day I would toss the veggies with the red onion, walnuts, parsley and remaining dressing. You want might to make a little extra dressing in case you need to add a touch more. Let me know if you have any problems – but this should work fine and look like you just made it :). This is such a beautiful summer salad. A classic combination that I want to come back to you year after year! Thanks so much, Monet! Have a good one. 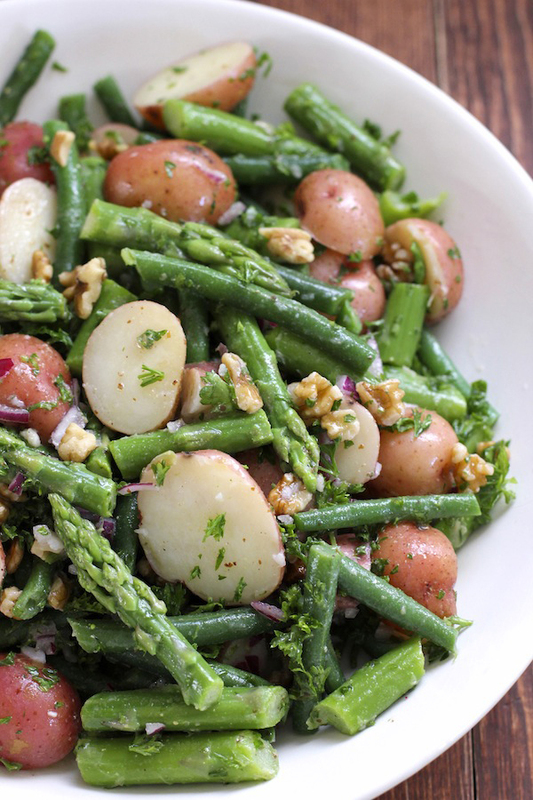 Love that you added asparagus along with green beans! This looks like a seriously delicious and healthy potato salad. Pinning! Hi Christin – the grocery store had asparagus so I had to get it :). Let me know if you make the salad. Have a great day! Thanks so much, Crystal. It’s not yet fall here, but this would make a great salad for the fall. Love potatoes and green beans together. Have a good one! WoW! Your photography! I could reach through the screen and eat this potato salad with my fingers! Your dressing combination makes this salad sing… with red wine vinegar and dijon?! I crave that combo with these veggies! I love how you blanched the green beans and asparagus! The textures and color looks amazing! Thank you, Geraldine! Hi Traci – this is one of the salads that you just want to grab one more bit with your fingers 🙂 – Have a great day!